Your browser does not support the video tag. Ingredients 8 large russet potatoes (12 oz/375 g each) scrubbed and dried 3/4 cup (375 ml) Lactantia® Tomato Basil Butter, divided 2 large shallots, finely diced 4 slices prosciutto, roughly chopped 1 clove garlic, minced 1/2 cup (125 ml) Lactantia® Cream Cheese, softened Chopped fresh basil (optional) Instructions Preheat oven to 400°F (200°C). Pierce each potato in a few spots; place directly on rack in oven and bake for 50 to 60 minutes. Remove potatoes from oven and reduce heat to 350°F (180°C). Allow potatoes to cool slightly. Meanwhile, in a large skillet over medium heat, melt 1/4 cup (60 ml) of the Lactantia® Tomato Basil butter and sauté shallots for about 2 minutes or when it becomes translucent. Add prosciutto and garlic; sauté for 2 to 3 minutes. Remove from heat. 1. Carefully slice top of potato off for about 1/2- inch (1 cm) down and scoop out flesh into a large bowl. Leave enough potato on the skins so that they do not collapse. 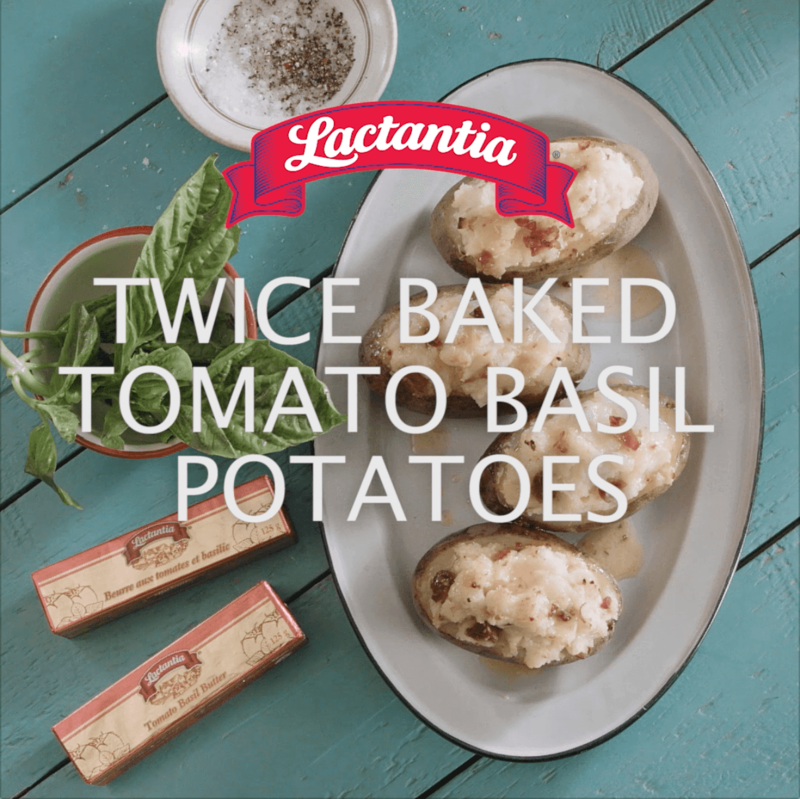 Mash potato with a fork or potato masher and stir in prosciutto mixture, 1/4 cup (60 ml) Lactantia® Tomato Basil butter, and Lactantia® cream cheese. 1. Spoon mixture back into the skins, mounding slightly and place on a baking sheet. Bake for 15 to 20 minutes. Melt remaining butter and drizzle over potatoes to serve! Garnish with chopped basil, if using. Pierce each potato in a few spots; place directly on rack in oven and bake for 50 to 60 minutes. Remove potatoes from oven and reduce heat to 350°F (180°C). Allow potatoes to cool slightly. Meanwhile, in a large skillet over medium heat, melt 1/4 cup (60 ml) of the Lactantia® Tomato Basil butter and sauté shallots for about 2 minutes or when it becomes translucent. Add prosciutto and garlic; sauté for 2 to 3 minutes. Remove from heat. 1. Carefully slice top of potato off for about 1/2- inch (1 cm) down and scoop out flesh into a large bowl. Leave enough potato on the skins so that they do not collapse. Mash potato with a fork or potato masher and stir in prosciutto mixture, 1/4 cup (60 ml) Lactantia® Tomato Basil butter, and Lactantia® cream cheese. 1. Spoon mixture back into the skins, mounding slightly and place on a baking sheet. Bake for 15 to 20 minutes. Melt remaining butter and drizzle over potatoes to serve! Garnish with chopped basil, if using. Lactantia® Cream Cheese is premium quality and tastes great on its own or in your best recipes. Great for cooking or baking.